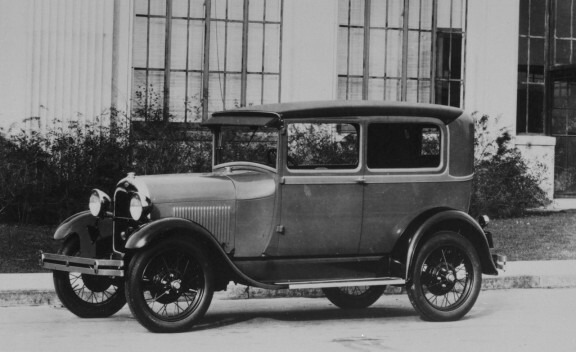 After months of open speculation by the press as to what the Model T’s replacement might be, Ford’s long awaited Model A was finally unveiled throughout the Dominion on December 2, 1927. Eager to be part of automotive history, tens of thousands of Canadians lined up in the cold and snow at dealerships to be among the first to catch a glimpse of Henry’s latest creation. 1928 Ford Model A Tudor Sedan. This Ford carried beautiful lines and was as modern as a Marcel hair wave, to boot. 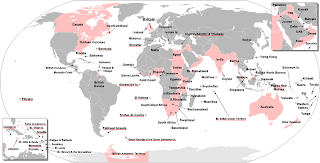 It boasted such up-to-date technology as Houdaille shock absorbers. Rustless steel was used for the radiator shell, headlamps and exterior trim. Electric windshield wipers, a Bendix starter, four-wheel mechanical brakes, safety glass in the windshield (an industry first) and even bumpers were thrown in to the base price. Under the hood loafed a 3.3-litre (205-cubic inch), four-cylinder engine that generated 40 horsepower. Its pistons were made of aluminum. The planetary transmission used in the Model T was replaced with a conventional three-speed manual shifter. The peppy little car could hit 40 kilometres (25 miles) per hour in eight seconds. No slouch on the roads, the Model A was capable of zipping along the nation’s highways and byways at speeds of up to 105 kilometres (65 miles) per hour. 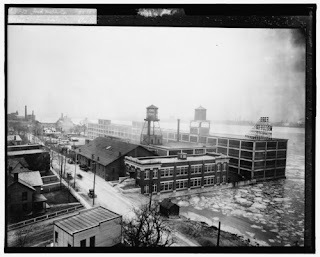 Built in Ford City, Ontario, the Mayor of nearby Windsor, was a big Ford booster. His Worship, Cecil Jackson, bought the first Ford sold in the Border Cities. He told the press proudly, “I’ve been driving a Ford ever since they started manufacturing them.” The Windsor Police Department took delivery of a hefty order, too. Sales were brisk. 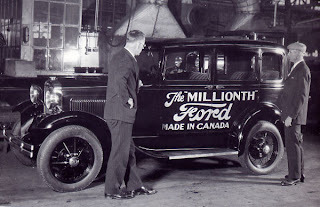 The total of Model A Fords sold throughout the Dominion during 1928 reached 32,960 units. Added to that total was sales of another 230 passenger cars imported from the United States. 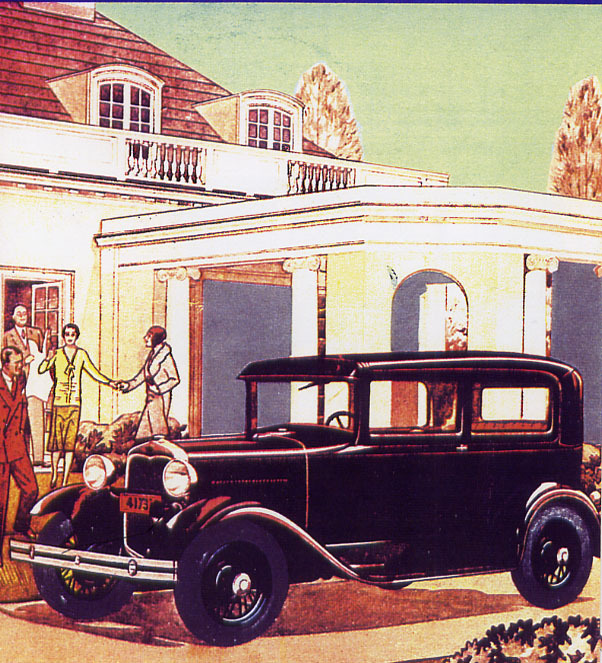 The 1929 Ford Town Car was seen in the most fashionable residential districts of Canada. In 1929 that sales figure reached 41,399 units. Then the stock market crashed. Sales for 1930 reflected the downward turn in the economy as domestic sales dipped to 36,306 units delivered. Though there was very little change from last year, for 1931 there were no fewer than 13 models to choose from. The sales theme was “Value Far Above the Price.” The Roadster was described as being “smart” and “alert” and “as capable as it looks. It sold for the rock bottom price of $515. There was a Tudor Sedan, Fordor Sedan, a Coupe, a Sport Coupe, and a Phaeton. New this year was a Convertible Cabriolet. Models could be had in base form or for a few extra bucks one could upgrade to the Deluxe trim version of some models that appeared mid-season to help sagging sales. 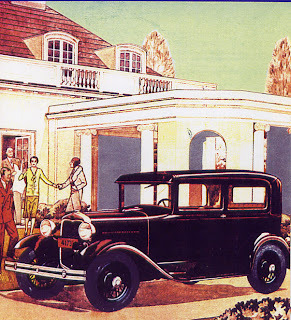 Arriving midseason, the 1931 Ford Town Sedan was a luxurious value at $750. Bodies were by custom coach houses Murray or Briggs. The stylish Town Sedan arrived partway through the selling season. It had bodies built by Murray or Briggs, both well-known custom coach houses. 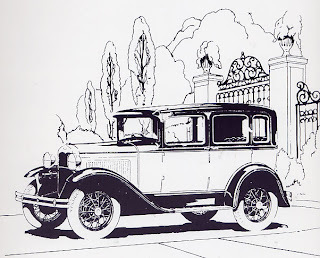 The luxurious automobile was carefully depicted in lush, upper class settings to appeal to consumers who wanted something a little better than basic transportation. Upholstered in Mohair or Bedford Cord or optional cost genuine shark-grain leather, it offered a folding armrest in the centre of the back seat as well as rear side arm rests. The window mouldings were finished in wood. The Town Sedan was easy to spot; it sported the latest styling rage, a raked windshield. It was the most expensive Ford offered that year with a list price of $750. The 1931 Ford Phaeton was another example of superior Ford value with low, fleet lines. The ragtop tipped the scales at 1 003 kilos (2,212 pounds). 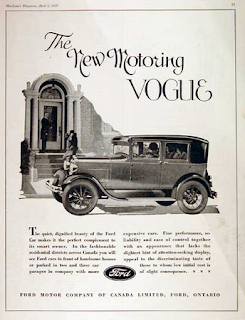 The watchword to the consumer was the improved economy one could obtain by buying a Ford. Salesmen were taught to emphasize the low purchase price, the low cost of operation and the minimal upkeep. The simplicity of the design, the high quality of the materials used and the accuracy in manufacturing and assembly were all strong selling points. These cars were fairly trouble free according to owner surveys and that certainly helped to sway consumers to part with their dollars in the dark days of 1931. Unsolicited testimonials didn’t hurt, either. One satisfied customer wrote, “I purchased a Model A Ford Coupe on May 8, 1928, and at this writing have run it 75,888 miles (122 129 kilometres). After I had driven 44,400 miles (70811 kilometres), I spent $45 in repairs and at 61,000 miles (98 169 kilometres) had an additional amount of work done costing $25. I have never had the brakes relined. My tire mileage has averaged more than 18,000 miles (28,968 kilometres).” His words were high praise, indeed. Oh, the Ford fan who wrote the letter was a travelling salesman. 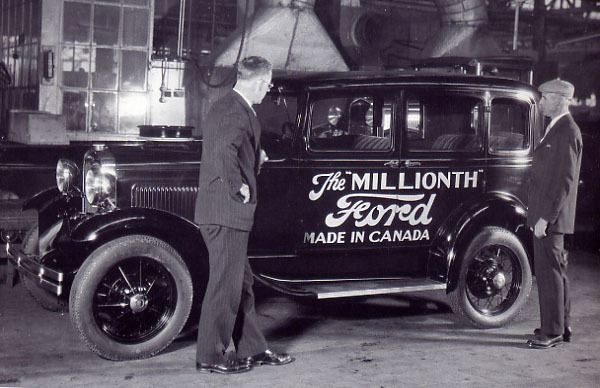 On March 24, 1931 workers at Plant Two finished the one-millionth vehicle to be built since the factory in Ford City began assembling its own engines back in 1913. It was a momentous occasion. Wallace R. Campbell, President of Ford Canada, and G. E. Dickert, Vice-President and mechanical chief of the plant were on hand for the event. All the hoop-la didn’t do much for sales. It turned out to be a tough year for Ford. Handwritten records on green graph paper show that a total of Ford 15,565 passenger cars were sold throughout the Dominion. That figure was down by more than half from the 36,301 units sold in 1930. The same firm hand details that 5,030 domestically built trucks and 33 Step ‘N Drive vans imported from the US were sold, as well. Tractor sales plunged from 1,013 units sold in 1930 to only 126 as the Depression hit farmers extremely hard. As the Great Depression deepened, sales of Lincolns across Canada dropped to only 20 deliveries in 1930. 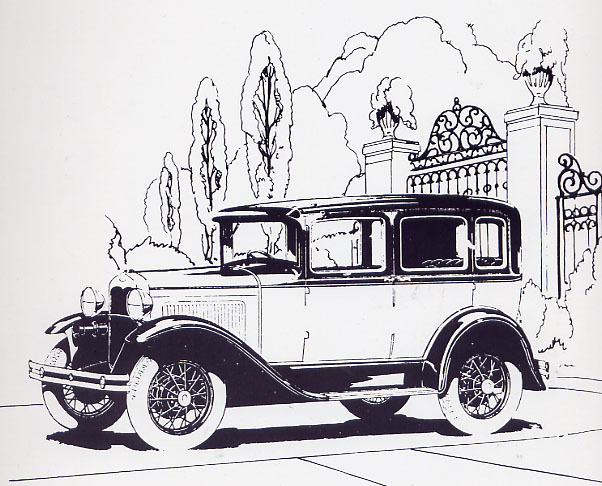 Sales of Lincolns reached 16 units, down by only four units as 20 were delivered in1930. Another 9,206 Ford passenger cars were exported to other parts of the British Empire, including115 Fords shipped to the Dominion of Newfoundland. 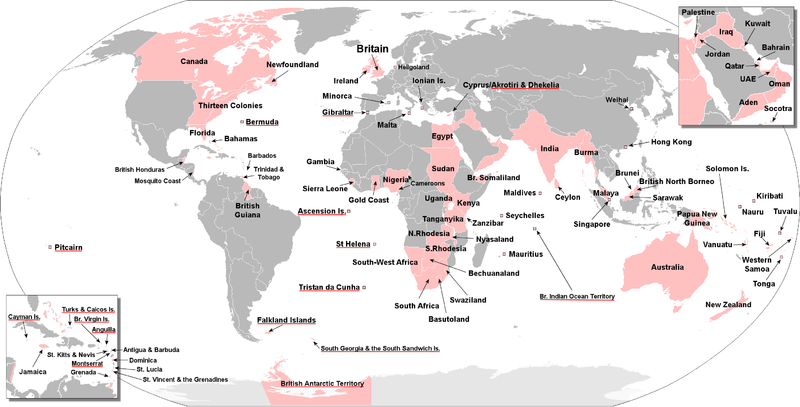 In 1930 the British Empire was home to more than 500,000,000 people, one-fourth of the world's population. The net loss reported to stockholders was $1,384,757.29. That final figure included $939,186.53 absorbed by Ford Canada’s wholly-owned subsidiary in Australia when the economy collapsed down under and Canberra froze the movement of money out of the country. New for 1931 was the Ford Convertible Cabriolet. It was equipped with a rumble seat at no extra cost. Still, the folks who held stock in the Ford Motor Company of Canada, Limited could smile just a wee bit as they received dividends of $1.20 a share and an extra 30-cent bonus. The company was still sitting on plenty of cash reserves even though there was no light at the end of the tunnel to signify the end of the sales slump, at least not yet. It’s a good thing that the boys in Windsor didn’t have access to a crystal ball. Domestic sales would slide even further downhill in 1932 and 1933.
rent 4K films too which is additionally created than DVD or Blu-pillar. BlueStacks not just offers the best versatile gaming background on PC, however we additionally offer you the BlueStacks Download chance to procure genuine prizes from your diversion. In the occasion that forming 192.168.0.1 into your program doesn't work, 192.168.0.1 may not be your PC's entrance everything considered. d&d 5e handbook pdf available here. download dnd 5e handbook from here. Full HD Live TV Channels Watch.